No one likes to think about insurance. Yet, at the same time as a successful business professional, you understand the importance of being prepared and protected to the best of your ability by the unpredictability in life. At Merrimack, we will analyze your current insurance programs, identify areas of vulnerability and provide you with a comprehensive strategy to strengthen your business operations and to minimize any exposure to the unpredictability of life. Many individuals recognize the benefits of planning for the future. Such efforts often uncover problems and frequently provide the motivation to make needed changes. For the most part, the issues involved are positive and enjoyable. However, planning for the unexpected –known as “risk management” can be less pleasant. A key part of risk management is answering the question, “What if I were to die today?” Preparing for an untimely death is often referred to as “survivor benefit planning.” A subset of estate planning, it addresses the need to keep one’s family in their current world, financially. Understanding no one likes to contemplate his or her own demise. For some, death seems a distant, future event. Others are simply too busy. Whatever the reasons, delaying this part of planning can result in expensive, unintended, even tragic consequences. It's true that a disabling injury occurs every two seconds according to the National Safety Council (1). Which means that, in an instant, the nest egg you'd built, a college fund, a retirement hope, a family plan, can be lost to the costs of long term health costs or work stoppage. While we can't predict the future, we can prepare for it, so that all those dreams and plans for yourself and your family are protected. Merrimack has been helping business owners and individuals in our area for over 25 years to ensure that when and if a health crisis does come up, they're financial health, their family's lives, are protected. Key Executive Insurance Programs are designed to provide protection in the event of death or disability to allow for successful continuation of your business and minimal interruption. The program comprises both Key Person Life Insurance and Key Executive Disability Insurance. Key Executive Insurance Protection provides peace-of-mind by ensuring that you and your employees - as well as their families - receive uninterrupted, tax-free income in the event of medical emergencies, whether illness- or accident-related. How likely is it that someone will become disabled? The table below, developed by using data collected by the federal government, shows the number of working-age Americans who have a disability that affects their daily lives. Long-term care (LTC) is the term used to describe a variety of services in the area of health, personal care and social needs of persons who are chronically disabled, ill or infirm. Depending on the needs of the individual, long-term care may include services such as nursing home care, assisted living, home health care or adult day care. The need for long-term care is generally defined by an individual’s inability to perform the normal activities of daily living (ADL) such as bathing, dressing, eating, toileting, continence and moving around. Conditions such as AIDS, spinal cord or head injuries, stroke, mental illness, Alzheimer’s disease or other forms of dementia or physical weakness and frailty due to advancing age can all result in the needs for long-term care. While the need for long-term care can occur at any age, it is typically older individuals who require such care. 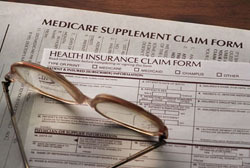 Some health insurance products offered by unaffiliated insurers.